Despite being raised in India, there has pretty much been only one sport which always appealed to me. It's football (ugh, soccer). And ever since I was a kid (before moving to the states), I have been a fan of one team and one team only. Whenever i describe myself (even on online forums like Twitter Bio, etc. ), I always take pride in being an Arsenal fan. So much so that it's part of our living room! 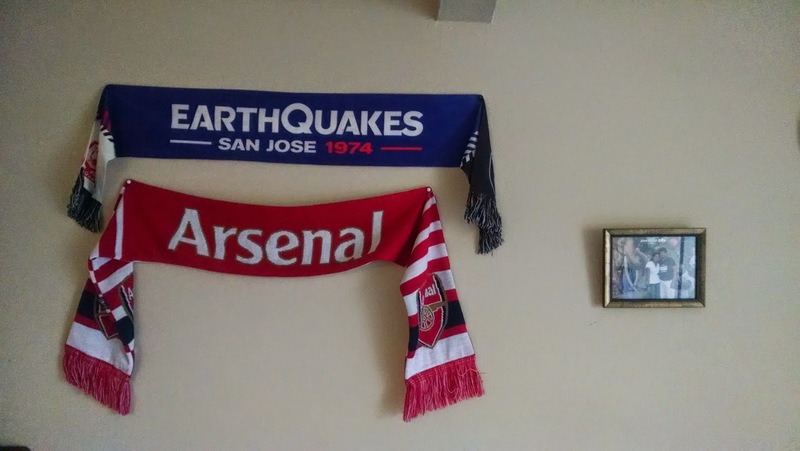 I moved to the states about two and half years ago and the Arsenal fan in me had a very interesting situation ahead. European football games typically happen on weekend and kick-off is usually somewhere between Noon and 5PM local time. For Arsenal, local time happens to be London time, which is 8 hours ahead my local time, thereby making the US west coast to be the worst possible region to live in for a European football fan. For a game starting at noon in London, i have to be up by 4AM. That's right, 4AM! Say the game is on Sunday at 1PM London Time. I'm usually out on Saturday nights pretty late (either a movie or something else). Spend some time playing games or watching something on TV. It's around 2PM or so at this point and dilemma ensues. Do i stay awake for 3 more hours and watch the game, or should i get some sleep (and risk missing the game by oversleeping)? More than often, i end up staying awake the whole night. Sudden existential crisis for the rest of Sunday. What now? When i was in school, we watched games as a group. Always as a group. When i moved to the states, I have been meaning to go to a sports bar and enjoy the game with a supporters group. But i have not managed to do so even once (usually because of the ungodly hours). Twitter came to the rescue. I usually tweet a lot during the game (and annoy the crap out of my non-football friends) and i have made a lot of new friends (living on various parts of the world) because of that. I now really feel that watching the game with Twitter feed open is as good as watching it with friends. And there's always casualties (TV Remote being the worst victim). I'm slowly getting towards a point where i might be able to afford to fly to London once or twice during a season. I am really looking forward to making it a habit of attending one or two games every season in person. And by the way, for the uninitiated, #COYG = Come On You Gunners.